THE MINI 60 YEARS EDITION. CELEBRATING 60 YEARS OF MINI. In 1959, British Motor Corporation proudly revealed a car that captured the imagination of the world and revolutionised the compact car segment. Six decades later, in 2019 MINI marks the brands 60th Anniversary. 2019 is a big year for us as we celebrate turning 60 years young. We’re marking this auspicious occasion with the release of the MINI 60 Years Edition. 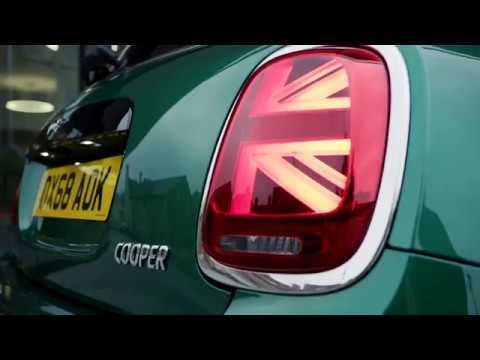 It’s a celebration of everything that makes MINI, MINI, from the unique go-kart handling to our ever recognisable design, finished in British Racing Green. Keep an eye on our social channels for more 60th anniversary activity. The seats of the MINI 60 Years Edition are upholstered with exclusive MINI Yours Leather Lounge in Dark Cacao – an exclusive leather for this vehicle, complemented by contrasting green seat stitching and piping matching the new exterior paintwork. A special edition deserves a special set of wheels. These 17 inch two-tone alloy wheels have been designed uniquely for the MINI 60 Years Edition.